We almost didn't take this photo. It looks like everybody just jumped into position and smiled happily for the camera, right? If that's how you think most perfect family photos are created, you couldn't be further from the truth! Sure, that might happen with teenagers or older children, but with toddlers and a brand new baby in the mix? Not a chance! It's easy to look at other people's perfect family photos, and feel like their children must be completely compliant, just waiting to respond happily to my every direction. "Come and sit on Daddy's lap here." "Now put your hands together in your lap." "Perfect, now a big, genuine smile for the camera please." Is that how you picture other people's photo shoots going? What if I said that a few minutes before this photo, Mr 2 was in meltdown mode on the floor? Toddlers are not made to follow directions. It's a big part of your job at two or three to assert your independence and test limits wherever possible. If your child doesn't do exactly what they are asked during a photo shoot, they aren't being extra difficult or challenging. They are being a normal toddler! Throw in an unfamiliar place, a messed up nap schedule, missed snack times, or most of all, having their whole world turned upside down by the arrival of a new brother or sister, and they are a hundred times more likely to dig their heels in and flatly refuse to do anything we ask. This is normal. When you see a photo of a perfectly smiling family, don't assume it means they are different to your family. Don't assume the photo just fell into place. And don't assume that we couldn't create the same perfect moment for your family! So, if toddlers aren't cut out for posing in family photos, how do these moments happen? How DO you get photos of these little people that are genuine and happy, and capture their real personality? After Mr 2's meltdown, we called it quits for a while on the family photos, and let him have some Daddy time downstairs while we took some Mum and daughter photos and some big sister photos in my studio. When he had calmed down, he came back upstairs willingly. It didn't make it all smooth sailing from there, but combined with the other tips below, it at least meant we had a chance. This is what waiting for big/little brother to be ready looks like! Even if it's not normal snack time, it's amazing the difference a bit of food can make to a little body. Snack food that doesn't cause too much mess is perfect - nuts, chips, muesli bars or sandwiches, for example. Nothing unravels a toddler's mood faster than getting hangry. This applies both to mum and dad and to the photographer. Children will dig their heels in when they are feeling disconnected and misunderstood. If there is a new baby in your family, this is probably their default setting. Give them some special one on one attention. Go at their pace. Listen to what they talking about, watch what they are engrossed in, and then bring that connection into the photo. I never set a time limit on any of my sessions exactly so that we have time to allow for this. 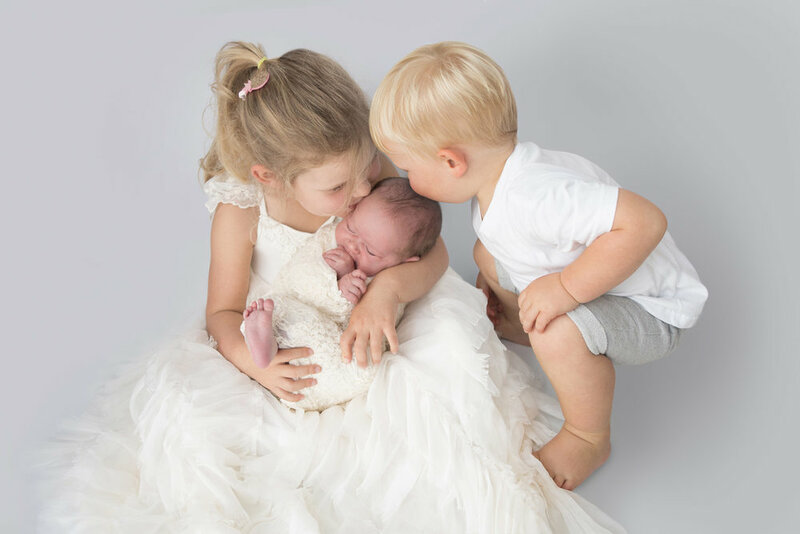 Connecting with the photographer is really important, and for family photos, feeling connected to mum and dad and feeling like they matter is even more critical. 4. Be silly with them. This family photo looks calm and sensible, right? Can you tell we were barking like dogs? Or that I had just pulled out my best cow impression? (Ok, so it's not very good, but a 2 year old doesn't really mind that!) Genuine smiles come from genuine connection, and that means being willing to be silly. Another sweet sibling moment - and I mean the "moment" part very literally! 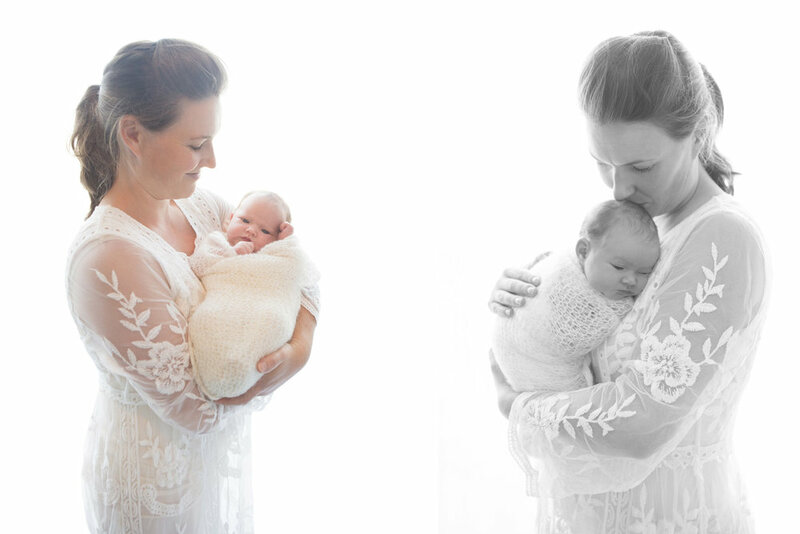 Want to see more photos of this stunning family in this gorgeous creamy, lacey, flowery newborn session? Pop over here.